Good Morning Everyone and welcome to a very special edition of Night Trax as we celebrate my 5 years on air as host and producer and it all started back on January 20th, 2014 the inaugural launch of this show and over the years it has grown from a small show to a success story unlike any other and not only do I have a successful show but since that same year I also gone to be a hugely successful athlete with the Special Olympics Ontario - Ottawa District in several sports including bowling and in just six weeks I will be traveling to Abu Dhabi UAE to compete at the Special Olympics World Summer Games for Team Canada. I want to thank everyone including the wonderful staff and volunteers here at Radio Carleton CKCU FM 93.1, my family, friends, Special Olympics Athletes and you the listeners for supporting my show since day one and making me who I am and here's ton another five years of Night Trax. Questions and comments much appreciated and hope you enjoy this very special anniversary broadcast. Cheers everyone and have a great day. Thanks for all the music professor! Great job. Been a listener since you first signed on with Kraftwerk. Good Morning to you Chris and glad you've been on borad since day one. 5 years of Night Trax, hard to believe and you the listeners are the keys to my success. Was that the last Andy Gibb record? I wonder. 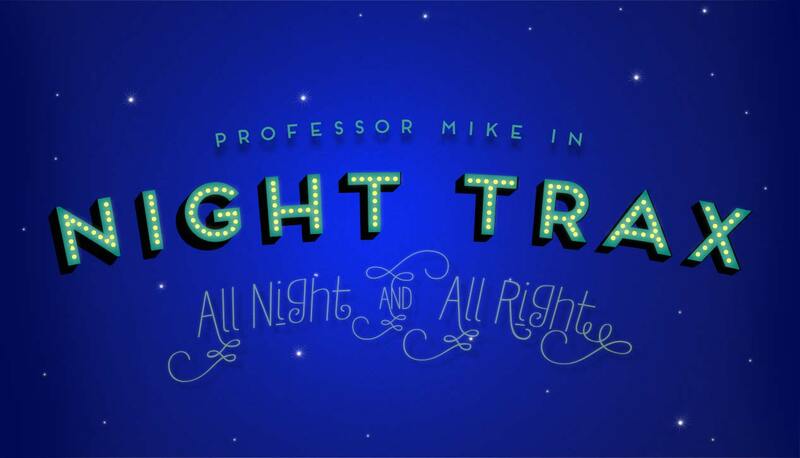 Congratulations Professor ‘Mike on five years on the air! Always an interesting, informative, and entertaining show. Here’s to five more years and beyond!